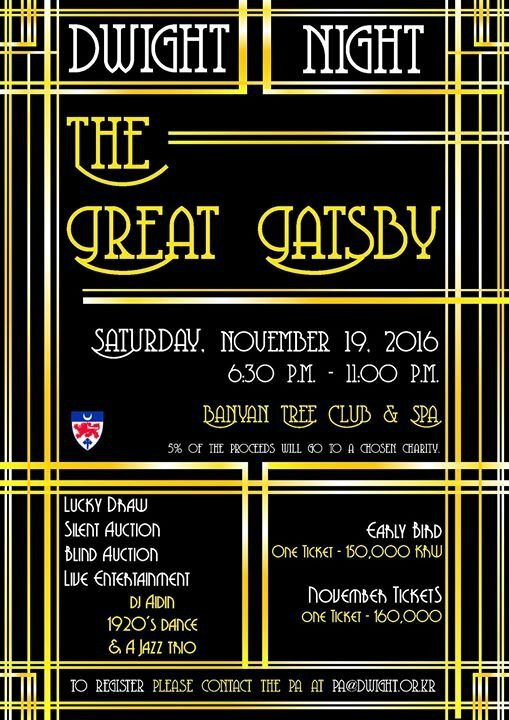 Dwight School Seoul will be holding its annual gala, Dwight Night on Saturday, November 19, 2016 at the Banyan Tree Club & Spa. Set to be a night of elegance, Dwight Night will include a decadent five-course meal, live entertainment including DJ Aidin, a jazz trio and 1920's Dance Group as well as the chance to win fabulous prizes in both our lucky draw and silent auctions. The money raised will go towards the Lower School playground with 5% of proceeds will go towards a chosen charity. The theme this year is 'The Great Gatsby' and will be a black tie event. Tickets are now on sale! Tickets will cost 150,000 KRW in October, and 160,000 KRW in November. The event is open to the public. If you would also like to bring friends, please feel free to pass on the invitation.